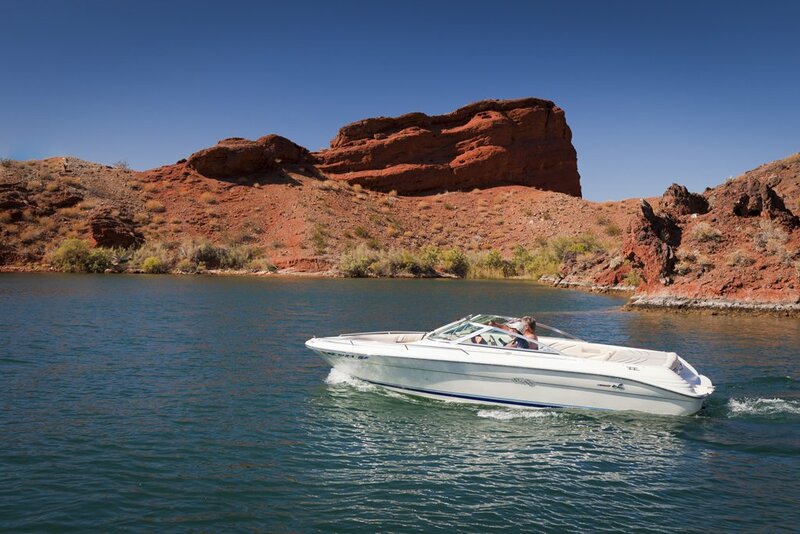 From boaters with high-performance race boats to those with cruising pontoon boats, there's plenty of room and lots to do for all on one of the most popular Arizona boating lakes. 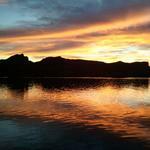 Boating on Lake Havasu is highlighted by a number of attractions. In addition to the Bridgewater Channel near the famed London Bridge, hidden coves and beaches are perfect places to relax for the day, or you can opt to explore the river, with its canyons, cliffs, and abundant wildlife--you won't find many lakes in Arizona that offer so much to do. Water temperatures range from 75 to 85 degrees, perfect for a quick dip. If a longer stay is what you're looking for, check out the many boat-in campsites . Since Lake Havasu is one of the top Arizona boating lakes, we always have updated news on boating events and facilities in our blog . 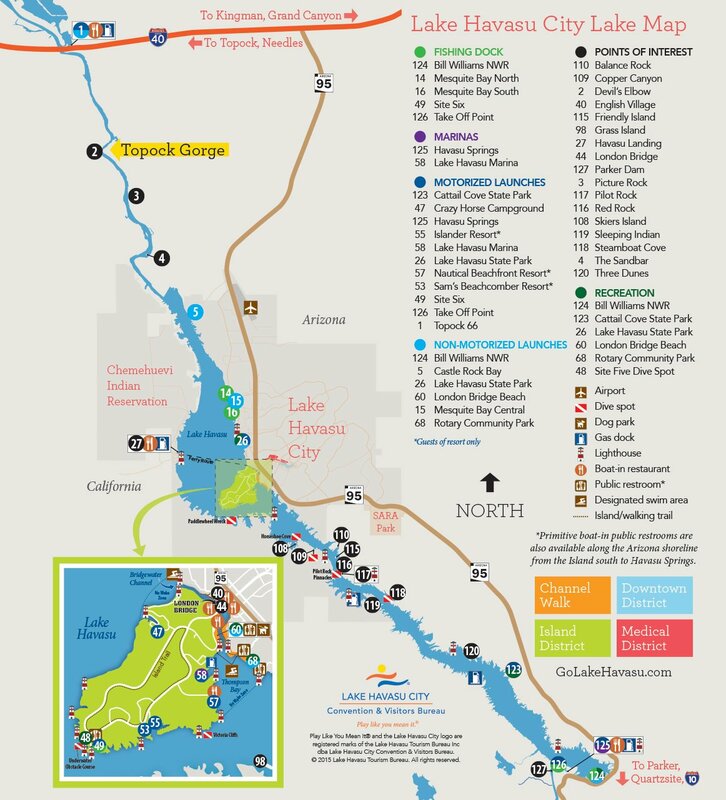 Here are just some of the must-see boating locations that make Lake Havasu one of the best lakes in Arizona. Every day is a virtual non-stop boat parade when you're at the Bridgewater Channel, the narrow ribbon of 'no wake' navigable water that runs beneath the London Bridge creating a waterfront for shops and restaurants. The southern end of the man-made channel is bordered by sandy beaches - a favorite resting, socializing and tanning place for boaters to "beach' during spring, summer and early fall. Grass Island marks the beginning point of Lake Havasu's lower southern portion, the gateway to places like Copper Canyon, Friendly Island, Steamboat Cove and Havasu Springs. Grass Island varies greatly in size depending upon the water level of the lake. At times of high water marks, the island is almost totally hidden. However, boaters need to take particular care when approaching the island because of shallow waters and very rocky bottoms surrounding the shoreline. In 1958, entrepreneur Robert McCulloch spotted Lake Havasu from the air and envisioned building a city /community along its shoreline. About ten years later, McCulloch and town planner C.V. Wood had a brainstorm to purchase the London Bridge from England and reconstruct it in Lake Havasu City as a tourist attraction. Today, the London Bridge is the second most popular tourist attraction in the State of Arizona, bested only by the Grand Canyon. In 1943, the U.S. military built the Havasu Auxiliary Airfield #6 to serve as an emergency landing strip as part of its World War II defense plan. After the war ended, Site Six was eventually purchased by Robert McCulloch as a test center for his McCulloch outboard motor line of products. Today, Site Six is a busy public recreational boating facility with launch ramp, docks, restrooms and a popular fishing pier. In order to enhance the fishing, a made-made structure was placed beneath the water to provide habitat to attract a wide variety of fish species. In the far reaches of Balance Rock Bay at the northeastern most point is a masterpiece of natural erosion at work. Sitting atop a slip pedestal of softer conglomerate rock is a solid mushroom-shaped mass which weighs many tons. The pedestal base was formed over thousands of years thanks to natural stream erosion removing the softer lower rock material below at a faster rate than the more dense rock above. You can boat right up to it or hike to it from SARA Park. 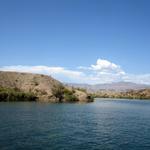 In years past, Copper Canyon was considered Lake Havasu's number one gathering place for boaters looking to party. Today, Copper Canyon, still popular with boaters and as breathtakingly beautiful as ever, offers a bit calmer, more serene atmosphere. The entrance to the canyon cove is now marked with "no wake" buoys and an open access lane is maintained for increased safety. It's hard to believe you could find a more ideal location for day or night boat camping than Lake Havasu's Friendly Island, located a mere four miles south of the heart of Lake Havasu City's famous English Village waterfront and the London Bridge. Friendly Island is exactly that, a small island located in Goose Bay that offers several sandy beaches with ample drop-off for comfortable boat access. The island is well protected from wind and boat wakes and has the convenience of restroom facilities, barbecue stations, and trash receptacles. It's a place perfect for family boaters. The afternoon sun lights up the cliffs of Red Rock cove, almost as though they are almost on fire. Located just north of Pilot Rock on the Arizona side of the river, Red Rock is a popular bass and striper fishing ground for late day anglers. The intense hues of the red rock cliffs is so vivid that the water immediately beneath the cliffs turns a deep amber color as well. Boaters are able to safely approach the cliffs for a closer look as this portion of the lake is among the deepest sections of the southern end. This is one of the favorite places on the lake for family boaters to take youngsters to learn to ski, wakeboard or be pulled around on water toys. 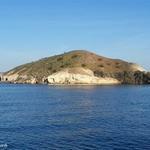 The natural cove is protected from boat wakes and traffic by a large rock island. Water depth is excellent on all sides with no worries of dinging a prop or running aground. And if the kids tire of water sports, bring along a fishing pole or two, since bass and stripers are often found in the immediate area. One of the frequently told legends of Lake Havasu is that of the "Sleeping Indian," a distinct silhouette formed by three mountains merging together to create an image that resembles a great Indian warrior sleeping during the sunset. This silhouette, which can be observed in the area of Steamboat Cove, is best viewed in late afternoon as mountain shadows against a muted sky outlines with warrior from head to toe. Located on the Arizona side of the lake across from and about one mile south of Havasu Palms Resort (on the California side), Steamboat Cove is the most protected natural cove on Lake Havasu. Boaters have found this to be a popular gathering place thanks to its calm water and sandy beaches. Because it affords excellent protection from wind and boat wakes, Steamboat Cove is a much sought-after destination for boaters looking to spend a day aboard or enjoy an evening of overnight camping. The Bill Williams River is located at the far southeastern end of Lake Havasu. It is a 6,000 acre National Wildlife Refuge and is said to contain the largest surviving cottonwood-willow woodlands of the lower Colorado River. Most importantly, the Bill Williams River is home to more than 300 species of birds and waterfowl. Arizona Game and Fish carefully monitors the area and are actively involved in propagating a number of endangered species including the razorback sucker fish and bony-tail chubs which are indigenous to the area. The refuge was also named an area of global importance for birders by the Audubon Society in 2011. Located on the California side of the lake across from Site Six are the Chalk Cliffs, large gray/white formations comprised of Kaolinite, a soft rock produced by dormant hot springs which once percolated through cracks in the mountains. The Chalk Cliffs are most impressive early in the morning and in late afternoons, as low sunlight illuminates the massive rock face in stark contrast to the surrounding topography. About two miles from the southern entrance to Topock Gorge is a massive rock formation on the Arizona (east) side of the river known as Picture Rock. If you approach the rock closely by boat and look carefully, you will likely see remnants of prehistoric petroglyphs carved into the stone face. This art is proof that the Colorado River area was inhabited by Native American tribes thousands of years ago. There are few places on earth that offer more diverse topography than Lake Havasu, and nowhere is this diversity more evident than the "sand dunes" bordering the Arizona side of the river less than one-half mile south of the entrance to Topock Gorge. The Sand Dunes, surrounded by jagged rock cliffs, stand several hundred feet high and disappear at the bottom as they blend into the bright green reeds at the waters' edge. Please note that this area of the river is narrow; use extreme caution when stopping or anchoring in this area. Approximately 7.5 miles north of where the lake transitions into a river, boaters have found a natural gathering oasis called "the sandbar." Water depth ranges from ankle to hip deep and the bottom is silk-like sand, ideal for beaching and day-time anchoring. On busy summer weekends, it isn't unusual for as many as 500 or more boats to congregate on the "bar" with a variety of music emanating from powerful stereo systems and sun-bronzed lake-goers enjoying the casual atmosphere. Be careful when entering the area; the water in this portion of the river is fast-moving. Be prepared with anchor, spike and lines prior turning off your boat. Many people refer to Topock Gorge as a miniature Grand Canyon with its colorful, steep rocky walls and abundant wildlife. Topock Gorge is a little over four miles long, located approximately three and a half miles south of the I-40 bridge at Topock, AZ. The Gorge is part of the designated Havasu National Wildlife Refuge and a favorite place for boaters, kayakers and canoeists to enjoy the splendor of hundreds of species of birds, big-horn sheep and wild burros. The total Havasu National Wildlife Refuge encompasses 44,371 acres. Located on the California side of the lake across from Site Six are the Chalk Cliffs, large gray/white formations comprised of Kaolinite, a soft rock produced by dormant hot springs which once percolated through cracks in the mountains. The Sleeping Indian is a silhouette of a great Indian warrior at rest and can only be seen in the late afternoon from the area of Steamboat Cove.